This production was produced in 2008, years before the Mid-Century Modern craze popularized by Mad Men. In developing the design I studied the urban/corporate architecture, furniture and graphics of the 1960’s. Iconic Knoll, Eames, Bertoia, Cherner and Saarinen elements were incorporated into a speedy scene shifting mechanism involving overhead tracking panels reminiscent of several other shows I’ve designed with the same director and choreographer. 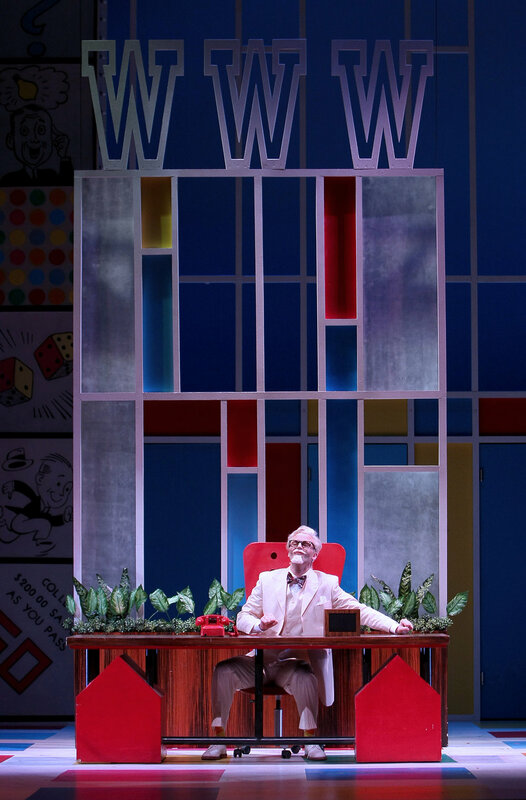 Integrating the design was a full stage illuminated Monopoly-style game board backing structure with individual light boxes that would light up on cue commenting on the stage action.